Happy Sunday everyone and thanks for stopping by! Hope the new year started off well for you all! http://www.bloggersentral.com/2012/11/pinterest-pin-it-button-on-image-hover.html I recently purchased this cute stamp, and thought it would work well for a little romantic card if I combine it with the right sentiment. The image has been stamped onto copic xpress blend it card, and colored using copic markers. I added glitter to the moon. 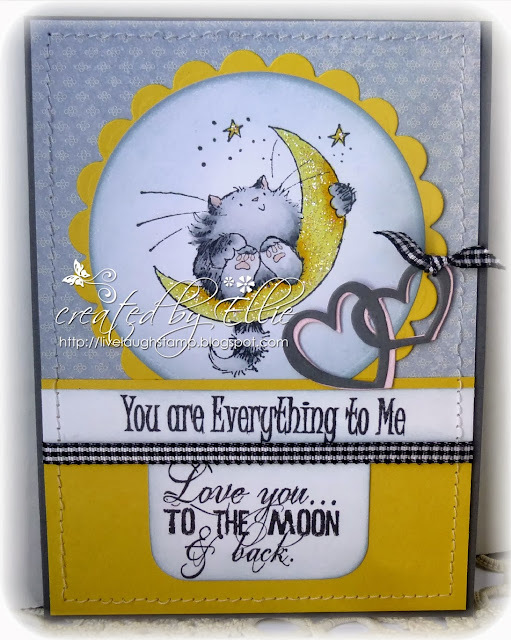 The top sentiment is from Flonzcraft stamps, who is also one of our sponsors this month. The bottom sentiment is from a set by Whimsy Stamps. White edges were all sponged with distress ink. To finish off the card I did some sewing, added a layered diecut heart shape, and some gingham ribbon. And that is all for today. If you'd like to play along with us this month, simply click the logo below. Don't forget you don't have to use a Penny Black stamp. Any make rubber or clear stamp works. We have several fabulous sponsors again, so plenty of chances to win! And don't forget about the chance at being invited to be a guest designer for a future challenge. A lovely design Ellie and beautifully coloured and the sparkle on the moon really draws the eye to the sweet image. aww, this is too cute ellie! i love the glittery moon and the yellow/grey/black combo. Absolutely gorgeous and so cute. Gorgeous love the image and papers. Great layout and colour combo Ellie. Gorgeous, love the sentiment Love you to the Moon and Back, my son and I always say that to each other.